The countdown to the most famous motor race in the world – the 24 Hours of Le Mans – has begun and, as announced in March, Murphy Prototypes is delighted to welcome three new drivers to its team specifically for the race: Ben Keating from Texas, Jeroen Bleekemolen from Holland and Marc Goossens from Belgium. The introduction of this experienced endurance racing line-up brings with it sponsorship from ultra-cool US auto-brand Gas Monkey and Texas-based Dodge dealership Viper Exchange, the largest Viper retailer in the world. Gas Monkey is using this sponsorship opportunity to promote its new Gas Monkey energy drink and next March’s week-long “Cruisin’ With The Monkey” Caribbean Cruise. The new livery for the team’s Nissan-powered LMP2 Oreca 03R was revealed ahead of the official test that took place on the 13.629km (8.46-mile) Circuit de la Sarthe last Sunday. 2016 sees Murphy Prototypes’ fifth consecutive appearance at Le Mans. 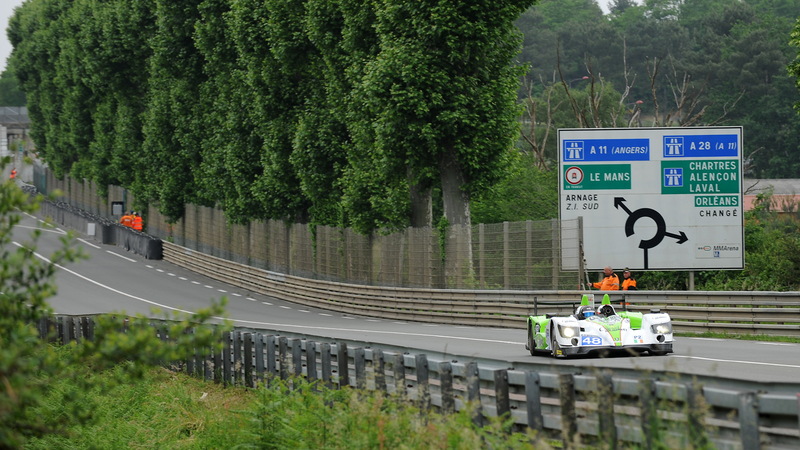 But this year it’s destined to be tough, as the LMP2 class is larger than any other with a total of 23 cars entered. Even so, the team will be looking to improve on its impressive performance last year, when it finished fifth in the class and 13th overall. Keating and Bleekemolen were team-mates at last year’s Le Mans, when they drove a Riley Motorsports Dodge Viper in the GTE-Am class, whilst for Keating, 2016 marks his first time in a prototype sportscar at this event and his second time in the race. For Bleekemolen, this year’s race represents his 11th time at Le Mans and his third time in an LMP2 car – having been part of the winning team on his first appearance in the category in 2008. Goossens, who has a wealth of experience in GTs and prototype sportscars, has competed at Le Mans 12 times since 1996, with his most recent outing in 2013 when he drove the Riley-run factory Dodge Viper in the GTE Pro Class. “With the line up we have, it’s a fantastic combination of ability, experience and versatility, which are all vital assets for success at Le Mans. We are also delighted that, thanks to our drivers, our car will be displaying Gas Monkey and Viper Exchange branding this year”, explains team principal Greg Murphy. The week-long build-up before the race is almost as legendary as the event itself, with scrutineering and public displays that feature all of the teams in the town’s Place de la République on Sunday and Monday. This is followed by a series of media events and the drivers’ autograph session on Tuesday, with two free practice and qualifying sessions on Wednesday and Thursday. Friday brings with it a host of attractions and activities laid on for the public, including the chance for spectators to walk the pit lane and take photos of the teams in their garages, followed by the always-spectacular drivers parade through the centre of town in the evening. And then it’s Saturday, when the tension mounts before the lights go green at 3.00pm for the most famous race on earth. “My first drive in the car was during the test in Barcelona a few weeks ago and it went really well. I enjoyed learning and driving the car. The Le Mans test also went well, but it was a very different experience to have so much traffic around me at those speeds. “I’m really looking forward to another 24 Hours of Le Mans. It is always the highlight of the year for me and this will be my 11th consecutive start. It’s great to return to the LMP2 class that I won back in 2008, especially as it’s such a strong category this year. The competition is amazing. Of course, it makes things tougher, but if you do get a good result, then it’s worth a lot more. “We have a strong line up of drivers that is really gelling together well. Combined with the fact that Murphy’s Men know the car from A-Z, I think we have a good chance of running up front in LMP2. I have all reasons to believe that the car is reliable, so if we can stay clean and spend the minimum of time in the pits, I am sure we can go a long way up the leader board.